How to Improve Your Writing: Practice, Practice, Practice! 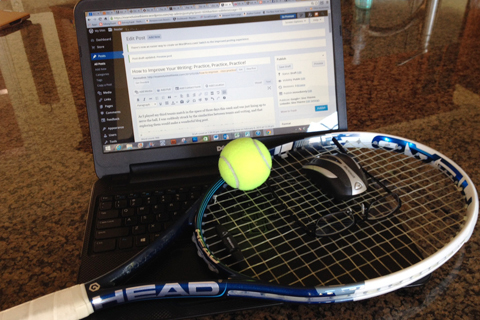 As I played my third tennis match in the space of three days this week and was just lining up to serve the ball, I was suddenly struck by the similarities between tennis and writing, and that elaborating on them would make for an instructive blog post. Actually, initially I was struck less by inspiration than by guilt: Here I was playing tennis yet again, and not writing. I was neither writing a blog post nor working on my new book or translating the existing one. I was playing tennis instead. I’ve actually been playing quite a bit of tennis lately. But that’s fairly new. I didn’t use to be a tennis player. I’d taken occasional lessons in the span of many years, played a few matches with friends here and there, and wasn’t much good. I’d have an occasional brilliant shot just to keep me from giving it up altogether, but many, many frustrating mistakes in between. Tennis, most of the time, seemed like too hard a nut to crack. But in practice, using what you know and applying it correctly is hard. You need countless tries, during which you make countless mistakes. And here is the thing: The more you practice, the more you plough through your mistakes and just keep going, the better you get. It’s slow going, and there are many days when you feel like you’ve actually gotten worse, not better, when you’re ready to give up. But if you just keep going and practice more and more and more, you will eventually get better. You will build that muscle memory that only thousands (precisely 10,000, if you’re to believe Malcolm Gladwell in Outliers) of hours of repetition can build. You can take lessons and watch the pros and read books till the cows come home, but you can never replace that muscle memory that is only earned by painstaking practice after practice. Have you noticed how we’re not really talking about tennis anymore? It’s so frustrating that you have to go through all that practice on your quest to improve, isn’t it? It costs time and sweat and pain. It’s especially hard as a writer. In tennis, you can just put all your embarrassing games behind you and move on. In writing, you leave much more of a trail. You can go back to what you wrote on your blog three years ago and cringe. Did I really say that? Did I really use such clunky grammar? Yep, I did, and people read it back then and told me it was good, and now I know that they were either lying or not very seasoned readers who didn’t know any better. And yet there is no other way to improve your writing: You have to practice, practice, and practice! Oh, and in case you were wondering about that tennis ball I was about to serve? I barrelled it down the line perhaps twice as fast as three months ago, impossible for my opponent to reach and leaving her speechless (and leaving me smug), to win the game. That’s how many hours I’ve put into my tennis game the last few months. Sadly, those same hours were lost to my writing. Which you can probably totally tell by the ramblings of this blog post. But I did manage to tell you about my awesome serve in a roundabout, phony, here-I’m-giving-you-writing-advice kind of way. And I got my 1,000 words in today.